Eudemons Music Editor is free software supported by donations, not advertisements. 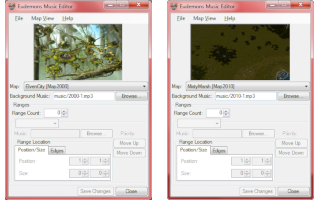 Eudemons Music Editor is a utility designed to read and change the background music for any map on Eudemons Online. When Eudemons Music Editor starts, it will automatically load every Map (and any Ranges in a Map) into a list (any Chinese names may be translated through the File menu). If a Map is selected, the minimap for it will be displayed (you can choose which size from the Map View menu or by left/right clicking on the minimap), letting you find similar maps or identify maps you don't recognize easily. When you've selected a Map, you will be given the options to set a file as the Background Music for that Map, and create or edit the Ranges of a Map in order to play different songs in different areas of a Map. The Login Screen must use an MP3 file, but all in-game maps may use any MP3, WMA, WAV, MIDI, OGG, or FLAC file (or other), but your computer must be able to handle the file type through DirectShow (you can find DirectShow codecs online very easily for any file type with a Google search). The Range system is a little more complex, and some explanation is required for precise use. Any map may have a number of ranges on it (I haven't tested the game's limit, if it has one). If you don't want any Ranges on a Map, simply set the Range Count to 0 (zero). Any other number will let you select one of the Ranges you've created from the Ranges dropdown box. Ranges each have a priority, starting with 0 as the highest priority. The priority determines which song is played if a player stands in a location where multiple ranges overlap (which is allowed). With a Range selected, you may choose a song to play, a coordinate position, and size for the Range to occupy. You can also move the priority of a Range up or down, if you need to re-organize them. The position system is based on your in-game location. Since the game is tilted at 2.5d style, you draw a rectangle (more like a diamond) starting with the top right point. For instance, if you wanted to draw a square around the Marriage Garden in the Market, you would start with the Cronus Map, adding a new range at say, point 286,524. We can determine this by walking along the edge of the circle and seeing what the furthest number we must go to encompass it is. If you don't want the edges, you could add one so that it only fills in the green area (287,526), but you'll need to compensate in your width and height calculations, too. In either case, this is the top of the diamond we'll draw around it. We then determine the width and height by subtracting the furthest bottom and left points we must reach from our top right, in this case, 304,542 gives us a width and height of 18,18. If you want to only edit a single point on the map, simply set the width and height to 0,0. Eudemons Music Editor also lets you Export and Import a packed copy of all of your changes. This lets you use multiple theme packs if you get tired of the same music. You can also share theme packs with your friends, but be careful, they get bulky with all the songs in them! Be the first to post a comment about Eudemons Music Editor! three more, what do you get?